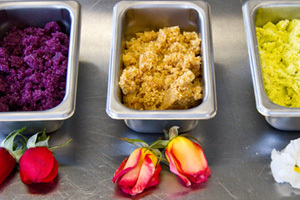 Edible flower pastes are a great way to distill the flavors and colors of edible flowers into a form usable in simple syrups (how to make flower simple syrups), sorbets and compound butters (flavored butters). Below you’ll find recipes for pansy paste and rose paste. Pansies have a delightful wintergreen-mint flavor. Most (if not all) of this flavor is in the small green bulbs at the base of the blossom, rather than in the blossoms themselves, so we recommend leaving these on when making the paste…they won’t hurt its color. Add the pansies and superfine sugar to the bowl of a food processor. Run the food processor until a paste is formed (several minutes). Periodically stop the blade and scrape the bottom and sides (the flowers will stick). Use as called for in your recipe. Edible roses are one of those edible flowers that are probably better referred to as “food safe” rather than “edible” in their natural form. Their petals are tough and if you eat them raw their flavor can be soapy. Pasting them allows you to extract their beautiful color and a more palatable flavor for use in recipes. If using whole edible roses, grab the stem end with one hand and the blossom with the other. Twist and bend. The petals should come off the stem, leaving most of the seeds behind. Give the petals a shake (and/or uncurl them) to get most of the remaining seeds out…but you can leave some seeds. Discard the stems & seeds & use 1 loosely packed cup of the petals per cup of sugar. Add the rose petals and superfine sugar to a food processor. Run the processor until a paste is formed (several minutes). The flowers will gravitate to the bottom and sides, sticking to the bowl, so you’ll want to periodically stop the blade and scrape the bottom and sides to mix them back in. You could likely use this same technique for other edible flowers…though we haven’t tried and so don’t know how well the flavor or colors will work. Generally we recommend using a single color of blossoms for a paste, as it’ll give you a stronger, cleaner color, but you could of course mix & match. Chopping the flowers into pastes often changes their colors somewhat (see photos for blossom vs. paste color comparisons). In a pinch, you could substitute conventional granulated sugar or organic evaporated cane juice for the superfine sugar. However, we’ve found that superfine sugar gives you a much better consistency, and is probably the better choice for most applications. We first learned this technique from Chef Traunfeld’s superb Herbfarm Cookbook.